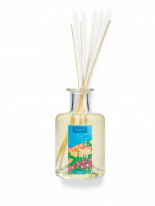 This reed diffuser fills the home with the infinite palette of perfurmes of the rose, the queen of the Grasse hills. This reed diffuser fills the home with the infinite palette of perfurmes of the rose, the queen of the Grasse hills. The diffuser is filled with room fragrance and comes with 10 reeds to be placed in the bottle. It emits a subtle and even fragrance for roughly eight weeks.